A story everyone knows, about a woman no one remembers. With libretto by Marie Clements, music by Brian Current, Gitxsan materials by Vincent Gogag (Gawa gani), and directed by Peter Hinton, this may be the most important work we have ever done. Missing is a co-production with Pacific Opera Victoria. It has been created by an extraordinary award of $127,000 from The Vancouver Foundation. Missing is set in Vancouver, and along the Highway of Tears. It is a story of two young women, one indigenous and one white, and the terrible and moving intersection of their lives. It opens in a way you might expect, and closes in a place you cannot imagine. On Wednesday 1 November, in partnership with Vancouver Moving Theatre and the DTES Heart of the City Festival, we present the opera to families and friends of the missing. This event is free, by invitation only, and sponsored by the City of Vancouver. On Friday 3 November, at The York Theatre on Commercial Drive, we begin its public run. Tickets are available for sale through the Cultch Box Office after Labour Day. Please join us. Would you like to help produce "Missing"? Though less costly than its grand opera cousin, chamber opera still comes at a price. With your help, we can keep tickets affordable and make performances accessible to more people. We would be deeply grateful for your assistance, and happily issue tax receipts. On Sunday June 11, we gave our 104th concert. 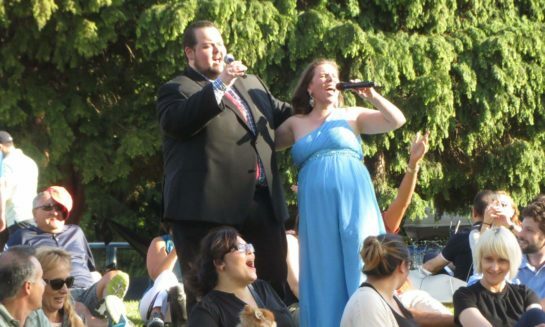 It was at Italian Day on The Drive, and featured City Opera artists Michelle Koebke, Sunny Shams, and pianist Roger Parton. It was free to all, and terrific fun. Tom Durrie, Michelle Koebke, Roger Parton and Sunny Shams at Il Centro. And then last night, we presented our 105th concert. 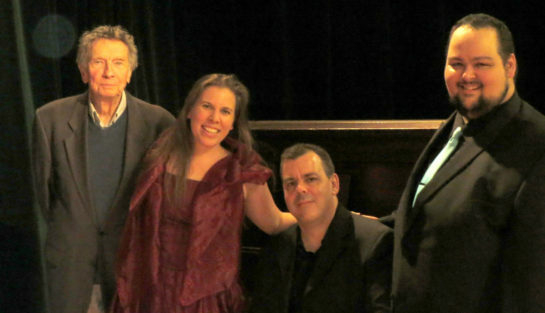 This was at Il Centro: The Italian Cultural Centre, again with City Opera artists Michelle Koebke, Sunny Shams, pianist Roger Parton, and host Tom Durrie, in an evening of Neapolitan music. The audience seemed to know – and love – all the melodies. Free, of course. Opera, ballet and burlesque! 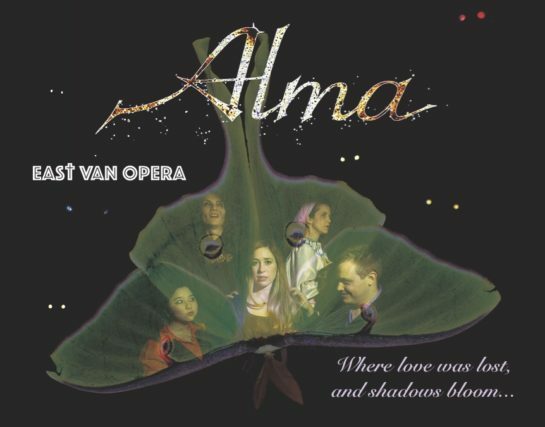 East Van Opera invites you to join our premiere of Alma, by composer Allison Cociani. It is a new opera for five singers, five dancers and an orchestra of twelve players. Alma is about the struggle between a young girl with special powers, and people who wish to profit from these abilities. She is abducted by Griselda and her three cohorts Kelsh, Tesh and Vidar. Alma must find a way to escape her captors. On learning that the evil-doers had not only kidnapped her, but in fact murdered her grandmother, Alma understands she is completely alone and must rely on her own wits to save herself. Ultimately Alma is a story about the road to personal understanding, and the end result of that path – forgiveness. In a crowded tavern the poet Hoffmann, urged on by his fellow drinkers, recounts the stories of his wildest, most outrageous loves and losses. 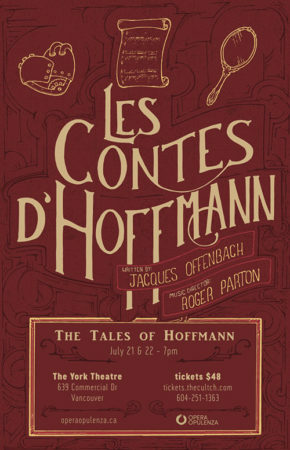 First performed after the death of its composer, Offenbach’s Les Contes d’Hoffmann is a masterful riot of characters and intrigue. Brought to life by a stellar cast, Opera Opulenza’s production of Les Contes d’Hoffmann reveals a world of danger, delirium and desire. Sung in French with English subtitles. 7pm on July 21st & 22nd at the York Theatre. Tix: tickets.thecultch.com. For more info: operaopulenza.ca.